Addressing a news conference in Abuja, governor Fayose criticised the zoning system for the office of the president by his party saying the zoning system has remained the reason behind the emergence of unqualified candidates for the number office in the land . He urged members of his party who are in support of zoning the office of the president to rethink their decision and described himself as the man for the job come 2019. 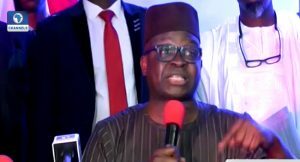 Governor Fayose vowed to defeat the incumbent President Muhammadu Buhari under a free and fair election, adding that the ruling All Progressives Congress (APC) had deceived Nigerians for more than two years. He said it was imperative to put an end to the APC’s deceptive government by 2019. Governor Fayose promised to return Nigeria’s economic fortune to a height of glory and ensure diversification of the country’s economy through agriculture, adequate power supply and creation of jobs for youths. “Our country is faced with myriads of problems, our economy that was the fastest growing in Africa when our party was in power has gone comatose with the present managers who are completely clueless,” he said . He told the news conference that Nigeria had never been more divided along ethnic and religious lines as it is now under the present government. On his party’s position that it has zoned the presidency to the North, Fayose said that no one had come out to express interest, adding that the PDP should not wait or beg anyone to fly its presidential flag. He said he was also confident of defeating other aspirants in the party, alluding his intention to the Biblical David’s defeat of Goliath. “I challenged the North to come out with their candidates. I want to challenge all of them to the field. What are you afraid of? Come out, I [have thrown] my hat in the ring. Let them come and face me,” he said.